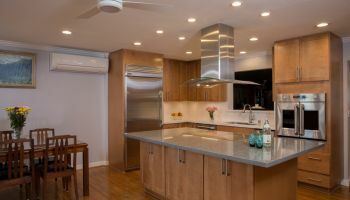 Hawaii kitchen remodeler Homeowners Design Center sometimes gets a little, or a lot, of inspiration directly from their clients. Mr. Takahashi was one of those homeowners who was especially good with his hands. Randall Omoto, the kitchen designer on the project, remembers that Takahashi had already done a lot of work on the space by the time he contacted Homeowners Design Center. "He's actually quite handy. He's an ukulele maker. He wanted to try and do the kitchen remodel by himself but needed help with the design," recalls Omoto. 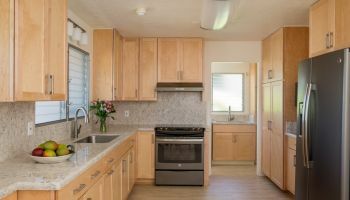 The company was able to help Takahashi plan the kitchen remodel to figure out what the space was and also imagine what the kitchen would look like when it was done. They eventually went with semi-custom, light, maple cabinets from Canyon Creek in the kitchen remodel because the customer wanted to do some unique things with the cabinets. "We chose (Canyon Creek) because... (they can) just make face frames and doors to cover pockets of space... to look exactly like the rest of the kitchen," says Omoto. For the kitchen countertops, the table top connected to the island and the island counter itself, so Takahashi went with natural stone. He went with natural stone because of the uniqueness of natural stone and of the varying color elements, which are difficult to find in quartz. The color he chose went well with the other choices in the kitchen remodel. Omoto fondly remembers Takahashi's handiness during the kitchen remodel when he recalls their dealings with the hood. "...I will refer to (this kitchen) many times because... (Takahashi) built (a chase)... (and) dropped down the chase (from the ceiling) to actually receive the hood in so... it wouldn't look so tall," says Omoto. Watch the following video to hear how the kitchen remodel all came together straight from the designer's mouth. Takahashi went with an engineered tigerwood flooring. What makes this hardwood such a good choice is because of its color variations. Because Takahashi's kitchen remodel had a number of unique color combinations coming from the two different shades of dual-toned stone for the countertops and the table, the cabinets and the appliances, the color striations of the tigerwood flooring, "...can draw (together) the different colors to help compose the kitchen better," comments Omoto. To learn more about how Homeowners Design Center can help with your kitchen remodel, just click on their name or on a photo.